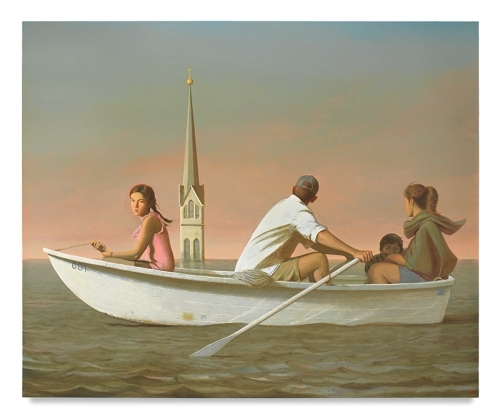 Bo Bartlett’s newest paintings at Miles McEnery Gallery balance the public and private spheres. In 1807 William Wordsworth published a sonnet that could have been written yesterday. The World Is Too Much With Us today as it was then, perhaps even more so with 24-hour news providing information into conflicts around the globe and on our failure to be caring stewards of the world we live in. In the summer, he and his wife, artist Betsy Eby, live on a tiny island 20 or so miles off the Maine coast. Wheaton Island is adjacent to Matinicus Island and forms the eastern part of the larger island’s harbor. Wheaton’s highest elevation above sea level is 26 feet and it comprises about 20 acres of granite ledge and trees. When the world is too much with him, he takes his dinghy out for a row around the island, to clear his head and to become-as it were-grounded. The dinghy is a recurring theme in his paintings. In The Flood, 2018, the rower (usually the artist) ferries his family over what was once dry land, attempting to secure their safety. It was inspired by the floods in Houston brought by Hurricane Harvey. The steeple of a church stands proud of the water and the parents gaze toward it as a symbol of hope. Their children, however, gaze into the watery distance hoping for hope. 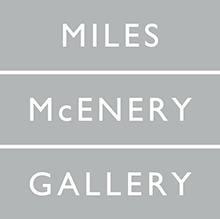 His latest paintings will be shown at an exhibition at Miles McEnery Gallery in New York through July 7. Among the paintings is a small gouache, High Tide, 2017, looking toward the sea from the French doors of his studio. High Tide is a reminder that living on an island “it could be a matter of time before the water is lapping at the door,” Bartlett says. The blue sky and water are the colors of Maine at its most striking although the soft, shifting, gray fog can create its own soothing mood.